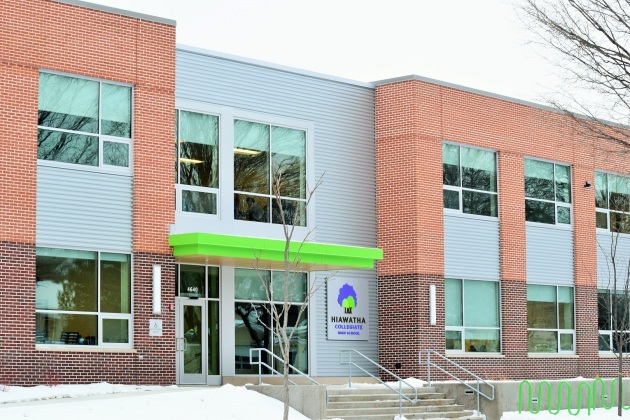 More growth is on the horizon for Minneapolis charter school network Hiawatha Academies, which opened doors to its first brand-new two-floor high school near Lake Hiawatha this week. The schools’ mission has been closing the achievement gap in Minneapolis. After starting with a school in a wing of a church in 2007, it's expanded to serve approximately 1,000 students in two elementary schools, a middle school and a high school. The high school, called Hiawatha Collegiate High School, has 22 classrooms includes a gymnasium, science labs and a media lab, said Sean Elder, the charter’s chief operating officer. Approximately 100 ninth graders were temporarily attending classes in one of the elementary school buildings for the first part of the 2015-2016 school year while the new campus was under construction. “To have a brand-new building is exciting both for our staff, our students, our families, and really positions them well to continue on their path to and through college,” Elder said. Classes began there this week. A ribbon-cutting Thursday featured speakers including community organizer and activist Rosa Clemente, who gave the keynote. The maximum high school enrollment is 777, which the network expects it will reach in 2026. In that year, it projects it will enroll more than 2,200 students.